This beautiful property near a pretty village nestled in the hills above Tilaran has wonderful views over a major portion of the province of Guanacaste even up to Nicaragua. These photos do not do justice to the vistas that can be enjoyed in person. High in the hills, yet only a few minutes from the hilltop governmental and business center of Tilaran, this property is private yet convenient. A trip to the supermarket will take a very short time, yet on return you'll feel as if you're in your own private paradise, enjoying the temperate weather, the wildlife, and the colorful sunsets. 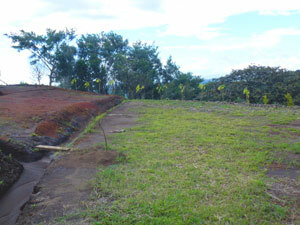 The owner has already partially prepared three building sites. Electricity and water are nearby. It's a beautiful place to live and a great value at this price. 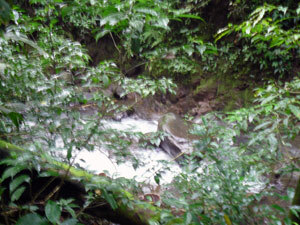 A year-round stream flows past the foot of the property and there are two natural springs. 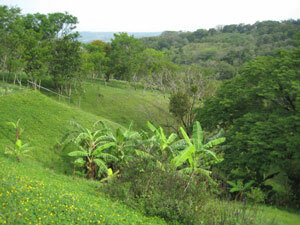 Click here for some information and photos of the village of Monseñor. The property hides near a village in the hills above Tilaran, itself a hilltop town of broad, clean streets, the commercial and governmental center for the Arenal region. 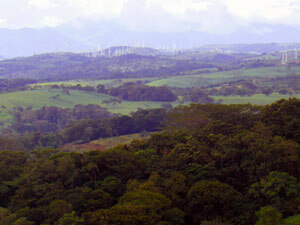 The vistas extend past Tilaran to the 200+ wind turbines, the dormant northern volcanos. 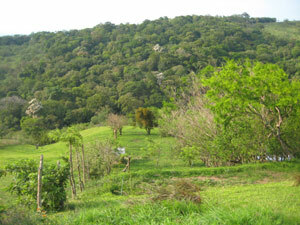 The property descends by various slopes and building sites toward a protected forest. The property has pretty slopes and wooded areas as well as the building sites. 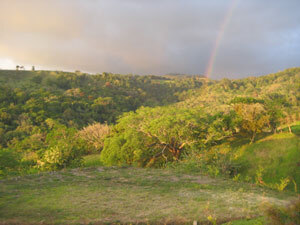 Seen from a building site, a rainbow adds new beauty to the forested hills. 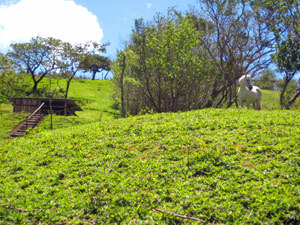 A strong year-round stream runs through the forested quebrada below the acreage. There are two natural springs. 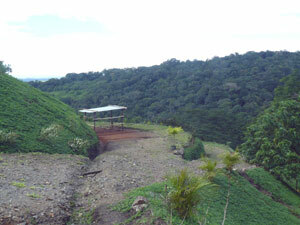 A thick forest reserve covers much of the immediate terrain. A horse stand on a bulding site and gazes toward Tilaran.